Missed our earlier interviews? They’re all listed at the end of this interview. Know someone who’s bringing their superpowers to work? Tell us here! Listen here (20:22) or read the transcription below. Darcy: Hi everybody, it’s Darcy Eikenberg here. I am the author of the book Bring Your Superpowers To Work: Your Guide To More Clarity, Confidence & Control. I’m here with another interview in my series of interviews with people who I just think are bringing their own superpowers to work; people I want to share and introduce to all of you. Today I am so excited to have Sarah Hathorn here. Sarah is the founder of a successful company, Hathorn Consulting Group. 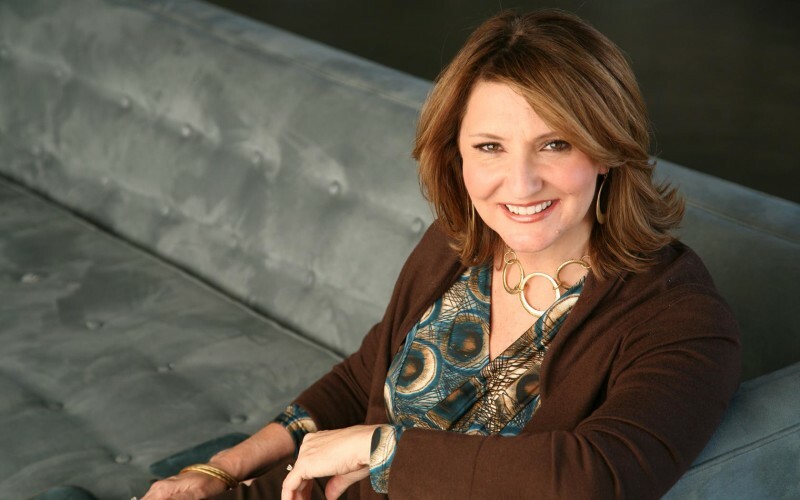 She’s an internationally distinguished leadership development mentor, an executive presence coach, an image and branding consultant, a public speaker and presenter, a great friend and fan, and just good all around person. We’re excited to have Sarah here today, so welcome Sarah! Sarah: Thank you Darcy, it’s a pleasure to be here! D: Great, I’m so happy to have you! Sarah has been busy traveling, teaching, and speaking – I’m glad that we were able to schedule some time for us to connect. Now, Sarah’s focus is really as a career acceleration expert. She has a program she calls the Predictable Promotion System. We’ll ask her to share a little bit about that. Sarah, just to start – I’m curious, tell us a little more about what a career acceleration expert does? S: I love it because I’ve always felt this real passion to really help people step up their image, their brand, and their whole presence about themselves to really gain greater career success. That’s really what my Predictable Promotion system that I use to really coach and consult people is really about. I do think that our career is sort of our identity, and I think that people want greater career acceleration, even in unpredictable times. It’s really about teaching them – as you said, to bring your superpowers to work – but in a different way, I think. It’s about, how do you really create a brand? How do you communicate up, down, across the organizational grid? How do you really get beyond those self-sabotaging beliefs that sometimes really stifle our confidence levels? D: Yes, I want to hear more about some of those sabatoging beliefs. I think that’s something we have in common– being frustrated by seeing people getting their own way. We both are very hopeful and encouraging people, and we know that there is more success out there than sometimes people think that they can get. But I’m curious for you – how did you get to where you are? 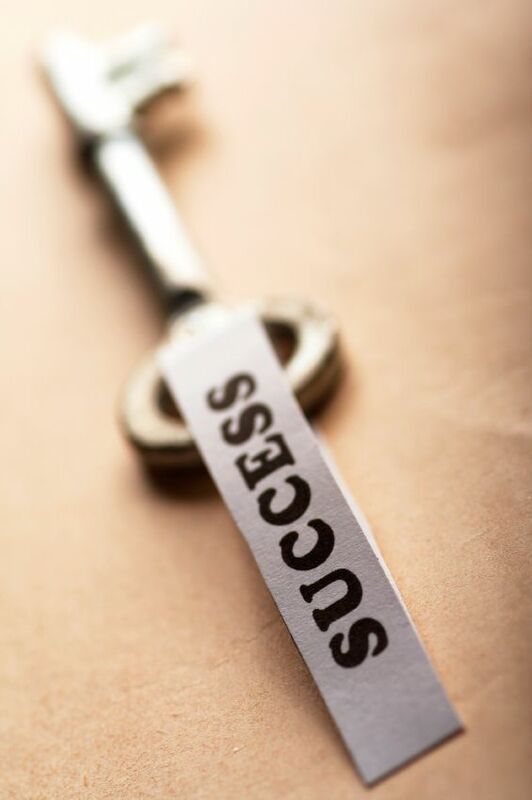 How did you create this success in your own career? That’s when I began to really study. I took workshops, I hired a coach, even back then. I did lots of things to really become what I call the CEO of my own career destiny. It was really through a lot of that work that I got promoted immediately, within 12 months or 16 months later! Then I knew how that felt, so then I started developing leaders at Federated. Many of the people that I’ve worked with are actually regional and district leaders and things like that today. So I bring my Predictable Promotion system – back then, I used to really help other people with it, even though it wasn’t called that back then. And so, I continued to accelerate my own career and developed talent for the pipeline. Then I left Federated several years ago, and started my own consulting practice. That’s what I really have a passion today to do, is to really help people realize their ultimate success in their career. Many times as you and I both know, they can’t get out of their own head and see it, but we know it’s possible. It’s about showing people the possibilities. D: Yes, and it’s really interesting that you were given a message by someone that you probably respected, or had some level of authority at least in your company who basically said, “Hey Sarah, this is it for you! You’re really not going any farther.” And recognizing – I call that “listening to the whispers” in my book – -having the self knowledge, hearing the voice inside you that says, “That’s just not adding up to what I really know about myself.” I love in your story where you didn’t let that pull you down. You took control. You said, “Okay. 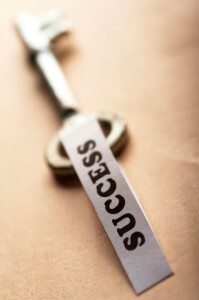 I’m going to study, I’m going to try.” It may not have worked out, but at least you moved forward. And in your case, it did! The actions and the investments you made in yourself moved forward to now where you’re able to help other people and put tools in other people’s hands. S: I call that in what I use in that terminology, that analogy – turn your setbacks into your empowering assets. It was a setback for me. But when I really look back on that day, I often times think would I have made it to a senior level executive position, had someone not told me that? Would I propel myself forward enough to keep going, even in the challenge of difficult situations, had I not had that crucial conversation with my boss that day? D: That conversation and what you learned from it, I think are part of your superpowers. They are part of what all add up. I think so often, we look at our pain points, our failures, things that people are judging us or evaluating us as negatives. But I see in your story so well how that really propelled you forward and motivated you forward. That’s great! Situations like that – you overcame that. But right now as you work with clients and corporations – I know you also do some work with entrepreneurs – but what are you seeing today as the self-sabotaging behavior? What’s getting in people’s way of being able to, as I say, bring their superpowers to work? 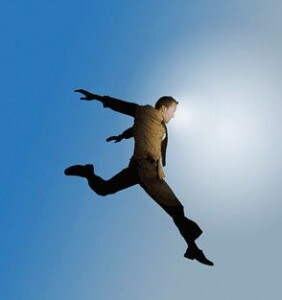 To be promoted, move forward, and get more career acceleration? S: Again, I think it goes back to a lack of confidence. To me, confidence really is that mental picture of our self-image.I think we’ve all had some pitfalls, set backs, whatever you want to call them in our life where we begin to doubt our abilities. But I think self-esteem it’s the hardest thing to overcome. It is absolutely in career acceleration, the key to move upward, laterally, or zig zag your way to the top as I call it. But you really have to gain that confidence, and our confidence comes within. The funny thing about that is when we question our confidence or our self-image, it begins to leak out. It leaks out to how we appear; we just don’t take as much time, we think we’re too old, too fat, too something! It comes out in our behaviors and it comes out through our body language and through our verbal communications. So I really say, our image is multifaceted. Our presence has many facets to it. But confidence is the one thing that is causing people to not rise to the next position. Or not, as I call it, step up and play a bigger game. They want to – but the first person they have to sell that career advancement to, is themselves, deep inside. It really takes a lot of inner work for people to realize, how are they having these self-erected roadblocks in their head? You know as I do when you talk to them, you just hear it. Right? Or on a coaching form, they send something and it says, “I only have an undergraduate degree.” or, “I’m not as good a presentation speaker as my colleague.” Or, I just had a client come into work with me – he has just been promoted, but he says, “Now I’m worried I’m not going to live up to the expectations of that new role.” Well, what is all of that? That’s lack of confidence! D: I love the fact where you said that really starts inside. I think so often, we’re waiting for permission or we’re waiting for the gift or approval. I like what you said as well about how it leaks out, and there’s a big part of what you do that’s very different than a lot of traditional coaches and other people who work in the field like myself do, you’re also focusing on the full issues of presence, including the choices you make about what you wear and where you show up. I know you have some professional training and also teach in areas of image and fashion – but fashion seems like it’s too understated. The importance of the message that everything that you’re putting out there is really sending. S: Yeah. So I think with dressing even today, it’s about, “What’s your personal brand? How do you want others to perceive you?” I think that’s important. We don’t want that cookie cutter corporate look, but on the other hand, you can’t go in looking like a fashionista either. There’s a balance between that. Your brand is part of who you are, and again, to accelerate your career. Do you know your leadership legacy? Do you even know what your personal brand is? But again, that takes a lot of unearthing inside of you, who you authentically are, who you want to be, and where do you want to go with your career. D: I curious though – with that, how do you go about working with someone who wants to build their confidence? When someone comes to you and you hear those clues, “I’m only this, I’m just that,” what are the types of things that you do to help someone bring their confidence along? S: That’s a great question. That’s actually what I end up doing with most of my clients, even though they don’t know that we’re going to get into that kind of work. Actually, it’s really about coaching them about where those self-limiting beliefs come from. One of the things that I’ve found in a lot of work and study that I’ve done in this, it usually comes from our past. Somewhere in our childhood, experiences that have happened to us, sometimes from people who are parents or teachers. Again, it’s those setbacks we’ve had along the way. We believed in those people telling us those things, and so those become our self-limiting beliefs. It’s really about exploring where those come from. It takes a little bit of work, but people usually really start to open up. Then when they open up, it’s about going through those and say, “Darcy, is that really a self-limiting belief? Is that really a limitation, or is that something you created in your mind?” Many times we find that it’s their own self-limiting belief. They believe that because they only have an undergraduate degree, they can’t move ahead. No one’s told them that, they just believe that. It’s about changing that negative inner chatter into a positive reframing of the chatter. So instead of saying something like, “I only have an undergraduate degree,” or, “I’m not as great a speaker as my fellow colleague,” it’s about changing that to “I have an undergraduate degree, and I’m a dynamic business person capable of moving to the next step.” Or, “I am an influential speaker.” It’s about shifting those internal thoughts and that internal language so that you begin to change the subconscious mind, and it actually begins to shift in how you begin to think about things and how you become more confident. D: It’s interesting how much of it is in our control. We control what we think. I say all we can control is what we say, what we do, and what we think. We can’t control other people. We can try to influence, but we can’t make them do something. So much is in our control. I’m curious as to the workplace has shifted and changed in the past few years – are there specific actions that you see people taking that seem to be boosting their confidence, even amid a time where so many people are not confident of what’s going to happen next? S: Yes. I really coach my clients around what you said. The only thing you can control is you. Sometimes it’s about looking from a different perspective of your organization. Many of my clients say there’s a lot of negative energy, because of people fear “am I going to be downsized? Right sized?” So there’s this environment they go into, and you can’t get caught up in that! All you can control is the job you do, how well you do your job, and really exceeding your performance objectives. You can’t control if they’re going to downsize your department or anything. It’s really about getting them to see it from a different perspective. I think that’s when they really they can only focus on themselves and step up their game, I think that keeps some of that negativism out of it. It keeps them very positive. As a leader, we all know people look to us for positive energy. Right? Not to be the one going, “Well… You know, it’s not really a great week around here…” Nobody likes that. We need to build teams that have positive energy, and that people see that there’s a vision and that there’s hope ahead. You can’t get caught up in everything around you. As you said, it’s just about who you are. Are you growing? Are you developing? Are you doing the very best you can? You can’t get caught up in the outside external circumstances. If they happen, they happen. You deal with it then. But most times what we worry about never happens. And we just spent all that energy on that. D: Yes, there’s so much focus, especially if people are growing their career, on taking care of everyone else– my team, my customers, my clients. And yet, the secret, when it comes down to it is am I taking care of myself? Am I understanding what I’m thinking? Am I putting my best foot forward? The things that you can control, it’s a real shift for many people to think that it’s okay to focus some time on yourself. It’s not a selfish behavior, that’s actually how you make your contribution into the world. Order Sarah’s free CD here! S: I think having the confidence to go in and make an appointment with your boss and say, “I’d like to get to the next step! Can you give me some constructive criticism on what I need to do to get there? Confidence is being able to listen and take it all in, and then take action upon what they give you. D: Or to evaluate if for what it is, similar to your situation. You didn’t just take the words of, “Hey Sarah, you’re not going to grow anymore!” at face value. It sounds like you evaluated it and you made your own choices. It just becomes data. S: Yes. That was my dream, to move up. Again, it’s about – do you know where you are going in that career destiny, and saying, “Where do I want to be in five or ten years?” I really call that more confidence and clarity, because you have to know where you’re heading to know if it’s the right opportunity or what you need to do to control your own career. You’re right, if you don’t like that message, then do something about it and step up to it! D: Exactly! Sarah, tell me what are the ways that people can work with you, or get other information from you if they want to explore more? S: I do private coaching with my clients right now on different levels. I have a platinum elite acceleration, a gold plus fast track and a gold success levels, which are all private coaching programs where people can work with me. I also offer VIP one-day intensive, where people fly in all over the United States to come in and work one day with me on anything from professional presence, communication, their career destiny, roadmap, any of that. 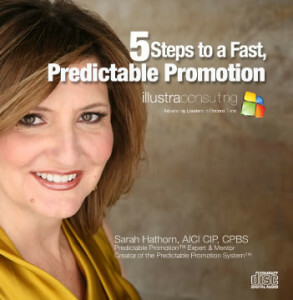 But the other thing I would like to offer your listeners today is that they are welcome to sign up for my free audio CD titled, Five Steps To A Fast, Predictable Promotion. They can get that atwww.IllustraConsulting.com/AdvanceNow. S: I can’t wait, though! D: Good! I’m excited to share with you! What do you think are your superpowers? S: My superpowers are helping other people to see the bigger picture, and how they can step up their game, and gain their greater confidence to really live the life that they want to live. D: That’s terrific. We need more people like Sarah bringing their superpowers to work, and to continue to grow and develop us all. Again, we’re here with Sarah Hathorn who is the CEO of Illustra Consulting, and IllustraConsulting.com. I want to thank her again today, and thank all of you for joining us here at RedCapeRevolution.com as we talk more about how to bring your superpowers to work. Thanks again, Sarah! Everybody have a great day! Know someone who’s bringing their superpowers to work? Tell me here! Join our next Ask Darcy call, where you can ask any career and work question where you need fresh answers–absolutely free!